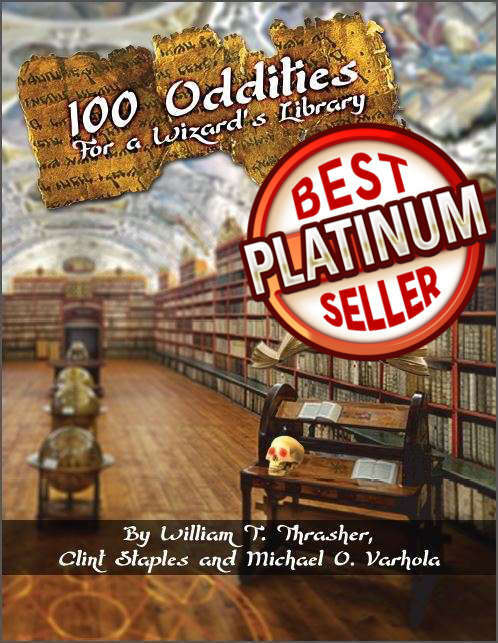 100 Oddities for a Wizard's Library,is the third in the 100 Oddities series from Skirmisher Publishing and the timing of this product couldn't be better for me. When your party finally reaches the top of the wizard's tower or the laboratory strong hold what are they going to find? The 1st edition DMG has a boat load of reference material but many players know that stuff like the back of their hand. Here's a resource that can be used for any edition or any game for that matter. All material here is straight up brand new and there are over a hundred random entries. This is a well done resource and clocking in at twelve pages is wall to wall weirdness perfect not only for a D&D style game or any old school campaign. But for a game where you've got an occultist pluming the depths of the supernatural and you need some bit of set dressing or plot hook for your PC's to stumble upon. This book can also be used as a perfect supplement for your wasteland warriors to stumble upon the lair of a sorcerer or wizard whose left behind a bolt hole or hide away in the middle of some god forsaken wilderness. The book is also perfect for those weird ruins of universities and libraries where wizards have come to make a lair in within them. Think about Sokurah the magician from the Seventh Voyage of Sinbad, he moves into the dungeon works of island of Colossa. This book is perfect fodder for what a party might find left behind after such a vile villain departs. There are certain entries with a vague and sinister air of the Cthulhu Mythos about them. These can easily lead adventurers into the machinations of a local cult or cast of vile villains who have traded with or done business with the wizard in question or is the wizard who owned the items actually the leader of such a cult? Which brings us to to another possible use for 100 Oddities for a wizard's library. This book can be used for Call of Cthulhu,Runequest, or any supernatural or occult hideout as well. Reading thought it I'm reminded of the abode of Zenobia from the classic 'Sinbad and The Eye of The Tiger'. In that film we get a glimspse inside her lair. And I always wondered what else was there. Well wonder no more. With a few toss of he dice you've got a lair of supernatural wonder fit for a wizard of sixth level or better. This book could easily fit the bill for investigating the ruins of a certain classic wizard school as well out in the world of the supernatural. The end of uses for this product is pretty much limited only by your imagination. The entries are well thought out by the Skirmisher crew and reflect a really well done twist on the usual style of these supplements. Clint Staples, William T. Thrasher . Thrasher, and the Skirmisher Game Development Group do a great job with the layout and artwork as well. I can see myself using this for some lost world wizard or even in a campaign world like my recent Thundarr games where the uneasy mix of relic technology & magic has made things very interesting for adventurers. All in all this is one of my favorite recent entries by the Skirmisher crew and its easy to see myself using this material in a wide variety of campaigns. Anyplace where a wizard has his lair is the perfect place to use 100 Oddities for a Wizard's Library.